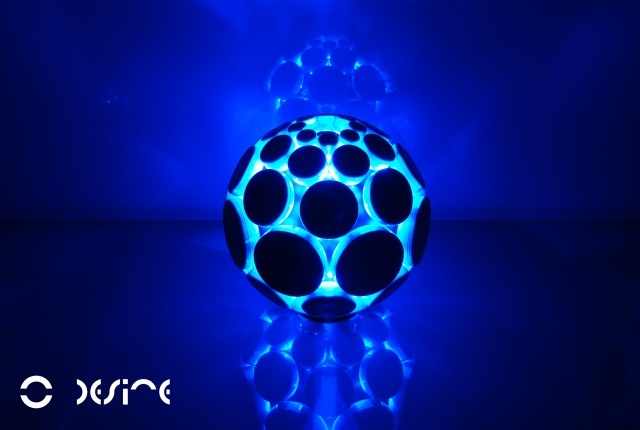 The AlphaSphere, a revolutionary new electronic musical instrument by nu desine has been nominated for Stuff magazine’s “Design of the Year” award, alongside such competitors as Microsoft, Google, Renault and Nokia. Determined by a public vote, nu desine a Bristol based start-up who have orders from across the planet, have very realistic expectations. “The teams who designed the device currently on the shelves of stores around the world are probably bigger than our entire company, but if everyone I know votes then I think we are in with a slim chance. I mean, honestly, who in a global corporate is going to be asking their granny to vote?” said nu desine’s founder Adam Place whilst attending a trade show in Shanghai as part of their crucial Asia Pacific strategy, which is supported by UKTI as part of their “Exporting for Growth” competition win earlier this year. Winning the “Exporting for Growth” competition directly resulted in Adam participating in a high-level trade delegation to Japan, alongside executives from Dyson, BAE, and many other leading British companies. The AlphaSphere will later this year be visiting Guangdong, Bristol’s sister city in China, to provide music for a reception with various representatives from the Chinese region. All of the directors of nu desine are currently in the Asia pacific region, negotiating sales contracts, signing off the AlphaSphere production tools and running electronics compliance testing for the worldwide market. Voting takes place online ( http://www.stuff.tv/win/design-of-the-year-2012?sid=1556477) to see which of the selected gadgets is deemed the most innovative.